Origin and Habitat: Encephalartos heenanii has an extremely limited distribution in the Barberton mountains in Mpumalanga (Southern Transvaal Province), South Africa in the vicinity of Piggs Peak, and adjacent northeastern mountainous areas of Swaziland. The extent of occurrence is 300 km², the area of occupancy only 5 km², and the remaining population is severely fragmented. In Swaziland it is estimated that 20 plants remain in the wild. The estimates for plants in the wild in South African are about 400. Altitude range: 750 to 1,750 metres above sea level. Habitat and Ecology: This species occurs on very steep slopes in short grassland in deep valleys between indigenous forests. The climate is hot in summer and cold in winter. The area gets summer rainfall of 1200mm per annum. The vegetation type is Montane Grassland. This species has been heavily exploited by illegal collectors for ornamental purposes and the few remaining plants could suffer from reproductive failure. Furthermore, habitat destruction as a result of the planting of pine plantations has also affected these plants because fire is prevented in this area and the plants are possibly adapted to a fire cycle. The plants have a poor reproductive success. The very small number of plants in Swaziland means that the only viable population is in the Songimvelo reserve in South Africa. E. heenanii is probably most closely allied to Encephalartos paucidentatus and several natural hybrids between the two species have been noticed. Description: Encephalartos heenani is a small to medium-sized arborescent cycad, 2-4 metres tall described in 1969 by South African botanist R. Allen Dyer. The trunk is well-developed and suckering or branching from the base. Mature trunks are erect or become procumbent (lying along the ground) with age. Leaves are 1-2 metres long incurved and often slightly twisted at the apex, giving a “cup-like” appearance to the plant’s crown. The plant has a swollen, semi tuberous rootstocks with few fibrous and many coralloid roots. Derivation of specific name: The epithet “heenanii” allude to Denis Heenan of Swaziland, who recognised this as a distinct species. Stem: Robust, usually single-stemmed with basal suckers, 2-4 m tall, 25-35 cm wide, densely woolly near the crown. Leaves (fronds): Characteristically curving upwards and inwards, 100-130 cm long, flat (not keeled) in section (opposing leaflets inserted at 180° on rachis). Central leaflets oblong-lanceolate in outline,120-150mm long, 15-20 mm wide, margin usually entire or (rarely) have 1 to 2 teeth. Leaflets light or dark green semiglossy and hairy strongly discolorous, not overlapping, not lobed; parallel veins on lower surface are distinct and raised, while the upper surface often has small wart-like protuberances. Rachis green, incurved, curving stiffly upwards, slightly twisted in some leaves. Petiole up to 20 cm long, recurved, spineless and is round in cross section. Leaf-base collar not present; basal leaflets not reducing to spines. 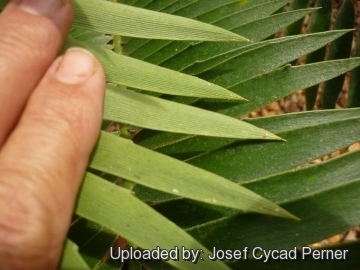 Cataphylls (scale leaves): The cataphylls (Modified leaf, much reduced and thickened, serving to protect the apical meristem in cycads produced in flushes preceding the emergence of cones or leaves.) are linear-lanceolate, often persisting in a dry brittle form on the upper half of the trunk and are very densely woolly with long golden brown hairs in the crown. Male cones: 1-4. Male cones sub-cylindrical, almost identical to female cones, but 27-30 cm long, 12-18 cm wide with a longer stalk, 8-9 cm long. They are yellow and covered with dense brown wool. Cones are seldom glabrous. Related species: Encephalartos heenanii is part of a group of similar species that share corrugately raised veins on the underneath leaflet surfaces. All them dwell on the mountains surrounding Swaziland. The group comprises the nominate species, the similar Encephalartos relictus and the quite different looking Encephalartos paucidentatus which is a plant of smaller stature with shorter leaves that are generally lighter in colour, more persistently tomentose, and more rigidly upturned to form a cup-shaped crown. All this species have widely differing cones. 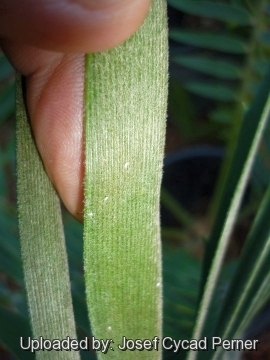 Raised veins on the underneath leaflet surfaces are also known in Encephalartos latifrons. 3) Donaldson, J.S. 2010. Encephalartos heenanii. The IUCN Red List of Threatened Species 2010: e.T41888A10569760. http://dx.doi.org/10.2305/IUCN.UK.2010-3.RLTS.T41888A10569760.en . Downloaded on 14 October 2015. 5) Haynes J.L, “World List of Cycads: A Historical Review”, IUCN/SSC Cycad Specialist Group, 2011. 6) Ken Hill: Encephalartos – In The Cycad Pages. 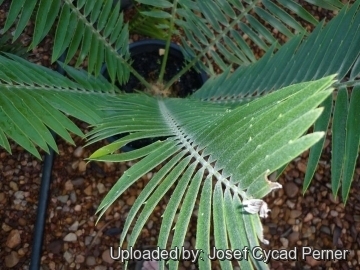 <http://plantnet.rbgsyd.nsw.gov.au/cgi-bin/cycadpg?taxname=Encephalartos+heenanii> Downloaded on 14 October 2015. 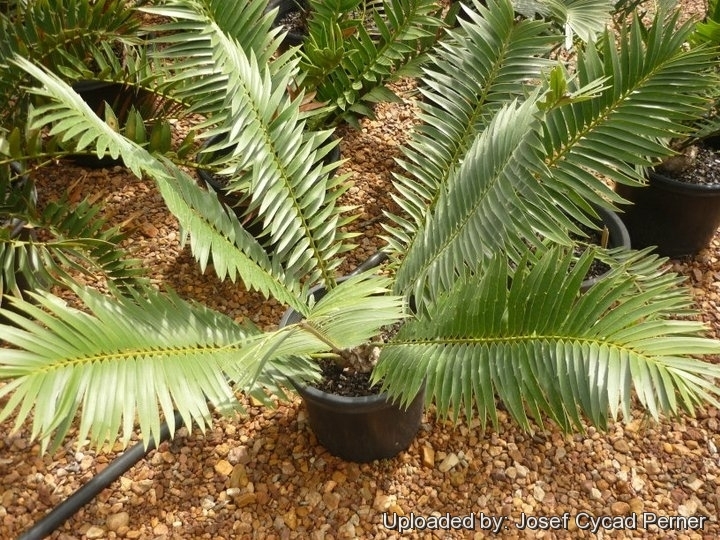 7) Cycad Society of South Africa 2001-2006. 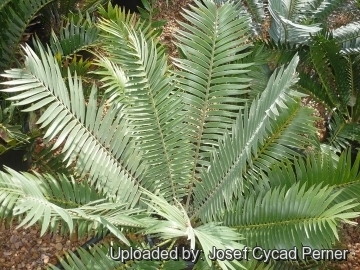 “Encephalartos heenanii.” Species pages <http://test.cycadsociety.org/?page_id=1790> . Downloaded on 14 October 2015. 8) Boon, R. “Pooley's Trees of eastern South Africa”. Flora and Fauna Publications Trust, Durban. 2010. 9) Emery, A.J., Lötter, M. and Williamson, S.D. “Determining the conservation value of land in Mpumalanga”. Report to the Department of Water Affairs and Forestry, South Africa. 2002. 10) Grobbelaar, N. “Cycads. With special reference to the southern African species.” (2nd ed.). Nat Grobbelaar, Pretoria.2003. 11) Hall, A.V., De Winter, M., De Winter, B. and Van Oosterhout, S.A.M. "Threatened plants of southern Africa". South African National Scienctific Programmes Report 45. CSIR, Pretoria.1980. 12) Hurter, J. “Focus on Encephalartos heenanii.” Encephalartos 40:4-7.1994. Cultivation and Propagation: Encephalartos eugene-maraisii is an adaptable plant well suited to warm temperate and subtropical climates. It is a frost-hardy species. With its bright foliage heightened by full sun is a commanding accent plant in the general landscape and makes an excellent specimen. It can be grown in full sun without its leaves burning. Its colour makes it a good subject for the nightscape. Its beauty and ease of horticulture make it one of the finest cycads for use in the garden. It is partially drought tolerant, salt tolerant, and completely wind tolerant. As a garden plant, this cycad will usually hold one or two crowns of leaves, all in good condition. As a seedling, it often loses its previous year's leaves before the new leaves emerge. The seedlings need plenty of room for the tap root to develop and require very good drainage.